Johnny takes us through the depression days, high school adventures and athletic achievements. World War II was a call to arms and in 1943 Johnny eagerly joined the Eighth Air Force, before being shipped to England. After an intense four months and three missions over Germany, including a crash landing, his crew was shipped back to the states. Several months later, Johnny returned to civilian life and after working various jobs in NYC moved to Savannah, Georgia to begin his career in the Army and Navy Store business. 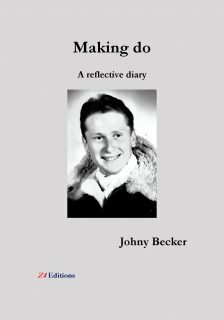 “Making Do” captures Johnny’s philosophy of life, that is, to make the most of what one has, regardless of one’s material circumstances.